Menthol (mentha arvensis) 15.30 mg, peppermint essential oil (mentha piperita leaf) 1.66 mg, lemon balm (melissa officinalis, herb top) 1.16 mg [1.25:1, QCE 1.45 mg], extract of Ricola’s herb mixture 12.67 mg: lemon balm (melissa officinalis) herb top 3.16 mg [1.33:1, QCE 4.20 mg], peppermint (mentha piperita) herb top 3.16 mg [1.33:1, QCE 4.20 mg], thyme (thymus vulgaris) herb top 1.90 mg [1.33:1, QCE 2.53 mg], sage (salvia officinalis) herb top 1.71 mg[1.33:1, QCE 2.27 mg], hyssop (hyssopus officinalis) herb top 1.71 mg [1.33:1, QCE 2.27 mg], black elder (sambucus nigra) flower 0.32 mg [1.33:1, QCE 0.42 mg], linden (tilia cordata) flower 0.32 mg [1.33:1, QCE 0.42 mg], high mallow (malva silvestris) leaves 0.13 mg [1.33:1, QCE 0.17 mg], horehound (marrubium vulgare) aerials 0.13 mg [1.33:1, QCE 0.17 mg], wild thyme (thymus serpyllum) aerials 0.13 mg [1.33:1, QCE 0.17 mg]. Non-medicinal ingredients: sugar, glucose syrup, Spirulina, Platensis Extract, glycerol, sodium citrate, citric acid, trehalose, Daucus carota sativus (carrot) root juice, invert sugar, sunflower oil, dl-alpha-tocopherol, lemon peel essential oil. a maximum of 10 lozenges per day. by high fever, consult a health care practitioner. Contraindications: Do not use during pregnancy or breast feeding. Do not purchase if package is open. All Ricola products are considered gluten free according to Health Canada regulations and are therefore suited for persons with gluten intolerance. All Ricola products are considered lactose free according to Health Canada regulations and are suitable for persons with lactose intolerance. Ricola Extra Strength sore throat drops provide relief for severe sore throats and cools your nasal passages so you can keep going. 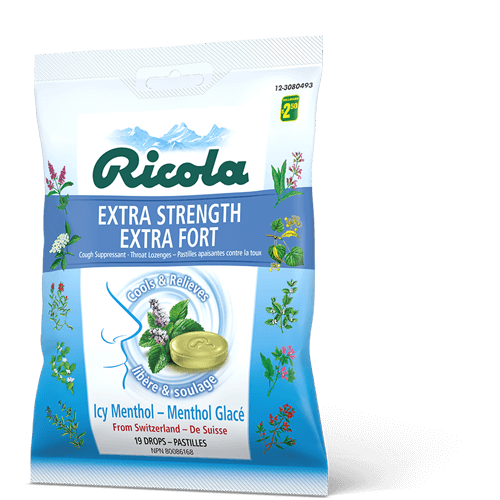 With the power of menthol and our unique blend of ten Swiss alpine herbs, Ricola Extra Strength sore throat drops give you effective relief when you need it most.